The ABC Trust is pleased to present A Força da Rua (Force of the Street), an exclusive contemporary street art project bringing together 12 of the finest artists from Brazil and the UK, including D*Face, Inkie, Titi Freak, Speto and Calma. Each artist will create a unique piece of art that will help raise funds and awareness for Brazil’s most vulnerable children. 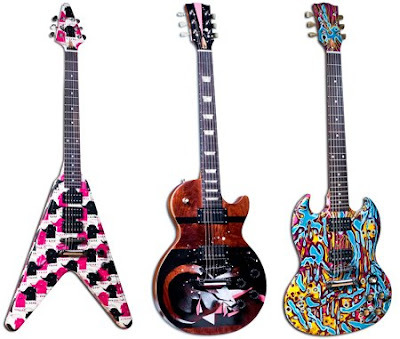 Gibson Guitar's a long time supporter of the ABC Trust charity have donated 12 of their most iconic guitars including Les Paul, Melody Maker, Flying V and SG all to be customised. These will then be exhibited at a central London location and are to be sold at a high profile VIP charity art auction at the Cuckoo Club on 29 April. The ABC Trust (Action For Brazil’s Children’s Trust), whose co-founder and Patron is Led Zeppelin’s Jimmy Page, have chosen graffiti and street art to work with as it reflects the rebellious free spirit of music and Brazil’s creative youth. Each of the artists’ work for the guitars reflects how art and music should be accessible and available to young people without discrimination and have the ability to inspire and transform. The auction will take place at the Cuckoo Club on Wednesday 29 April 2009. This event is by invitation only. Interested parties should contact Roberta at auction@forceofthestreet.com to attend the auction.